"Microbus" redirects here. For the VW Microbus, see Volkswagen Type 2. Not to be confused with midibus. 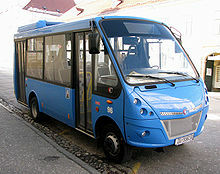 By size, microbuses are minibuses smaller than 8 metres (26 ft 3 in) long. Midibuses are minibuses bigger than microbuses but smaller than full-size buses. The most basic source of minibuses is the van conversion, where the minibus is derived by modifying the existing van design. Conversions may be produced completely by the van manufacturer, sold as part of their standard model line-up, or be produced by specialist conversion companies, who source a suitably prepared base model from the van manufacturer for final completion as a minibus. Van conversions involve adding windows to the bodywork, and seating to the cargo area. Van conversion minibuses outwardly look the same shape as the parent van, and the driver and front passenger cabin remains unchanged, retaining the driver and passenger doors. Access to the former cargo area for passengers is through the standard van side sliding door, or the rear doors. These may be fitted with step equipment to make boarding easier. Optional extras to van converted minibuses can include the addition of a rollsign for transit work, and/or a full-height walk-in door, for passenger access to the former cargo area. For public transport use, this door may be an automatic concertina type. For other uses, this may be a simple plug style coach door. Depending on the relevant legislation, conversions may also involve wheelchair lifts and tachograph equipment. A van conversion with a passenger area in the front and a storage area in the back, behind a fixed bulkhead, is called a splitter bus. Another method of building a minibus is for a second stage manufacturer to build a specific body for fitting to a semi-completed van or light truck chassis. These allow a higher seating capacity than a simple van conversion. Often, the second stage manufacturer is a bus manufacturer. In a body-on-chassis minibus, a cabin body is installed on a van or light truck chassis encompassing the drivers area. These designs may retain some outward signs of the original van, such as the hood and grill. Other designs are visually a complete bus design, and it is merely the chassis underneath that is from the van design. The body-on-chassis approach gives the advantage of higher seating capacity, or more room for passenger comfort, through a larger cabin area. There is also the advantage of being able to have the drivers seat positioned in a small cubicle, next to the main passenger entrance, allowing the driver to collect fares in a transit bus role. A next generation approach to the van-derived or cutaway chassis approach, is for manufacturers to produce an integral design, where the whole vehicle is purposely designed and built for use as a minibus. This is usually done by an integral bus manufacturer, although large automotive groups also produce their own models. These designs are often available in long high capacity versions, and may attract different designations, such as midibus, or light bus. Following the development of low-floor technology, some low-floor purpose built minibuses have been created. Some offer a low floor access through a centre door. Some short versions of low floor midibuses are sometimes also called minibuses. Dollar van a.k.a. jitneys, in the United States. Pesero, minibuses operating as regular buses in Mexico, especially in Mexico City. Public light buses, in Hong Kong. Anyone wanting to drive a vehicle in Ontario, with the same MAM limits as for class G vehicles, with fewer than 25, but at least 10, passenger seats, must obtain a bus licence. This licence will allow, for example, its holder to drive 12- and 15-passenger vans that Transport Canada defines as large passenger vans. 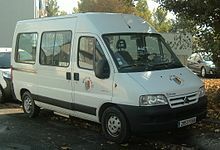 Wikimedia Commons has media related to Minibuses.